1 What is it like where you live? Is it a big city or a small town? Are there many buildings around, or lots of trees? Lots of roads and cars, or just a few? You know your home by the way it looks. But there's a lot you don't see. There's a lot under the ground you stand on. Underground, there are giant plates of rock. Sometimes, these plates move. When they move, earthquakes happen. 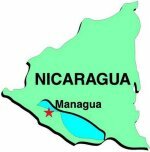 2 The capital of Nicaragua is a city called Managua. Managua is located next to Lake Managua. It also sits on top of five faults. Faults are the places where two underground plates meet. Managua is the largest city in Nicaragua. Most of the country's businesses and government are located in Managua. And 20 percent of Nicaraguans live in Managua. 3 In December 1972, Managua was a very happy place. The Nicaraguan baseball team had just won a world championship. There were many parties. There was also the Griteria de Maria. This is a party that starts the Christmas season. Then, something terrible happened. The plates under Managua moved.